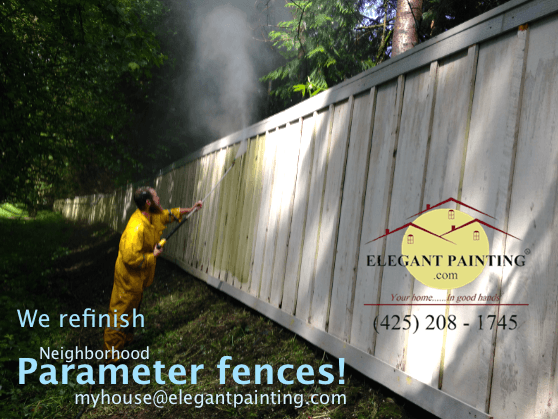 We use high power pressure washers to remove previous finishes and mildew growth from cedar deck board and railings. This process removes cedar pores from the surface. Once the deck is power washed we rince these cedar pores from all surfaces surrounding the deck including; plants, walls, windows, and the deck itself. This portion of the process involves a car wash brush and a high power rinse; either the highest setting on a garden hose nozzle, or the lower setting on a power washer. While trees and shrubs can easily withstand this level of water pressure, smaller annals, new transplants, and herbs might appear a disturbed for a few days. There is no need to remove patio furniture, BBQ, etc, but please remove anything delicate that you do not want our crew to handle or anything that can not withstand being rinsed or scrubbed down with a car wash brush. Our crew makes the assumption that your home is properly sealed and OK to be power washed. All Northwest homes are built to be power washed and our team cannot be responsible if any water enters the house due to incorrect installation of windows, doors, siding, etc.